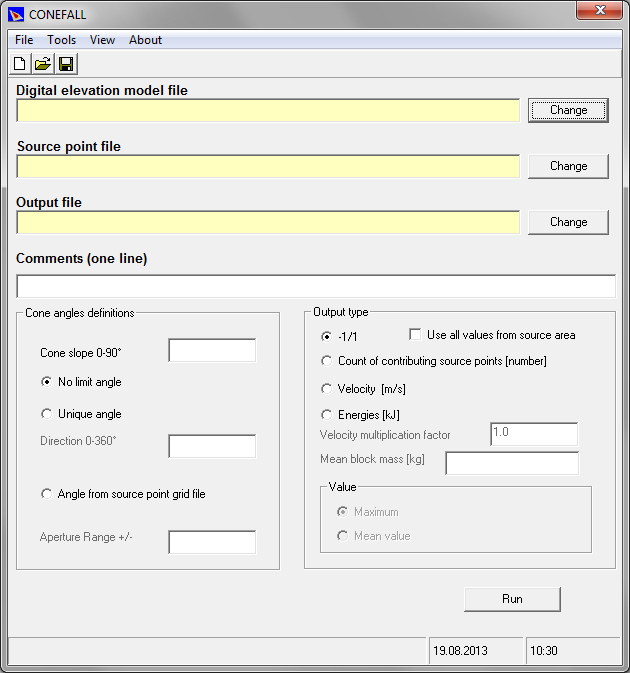 The program Conefall is designed to estimate roughly the potential rock falls prone area. Theory related to this program can be found in many different articles (Evans and Hungr, 1993, Toppe, 1984). The principle of the program is rather simple. A block can propagate if the slope is sufficiently steep. Physically consider that if the slope is steeper than a limit jp, then the block accelerates. If it is lower, it decelerates. Using the previous assumption, a block can propagate from its source to the point of intersection of the topography with line starting from the source point making an angle jp with horizontal. The space where a block can propagate from a grid point is located within a cone of slope jp with a summit placed at the source point. This procedure is applied to all source points.